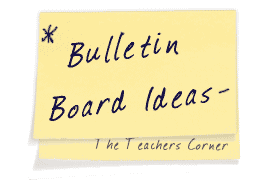 The Geography Bulletin Board Ideas page will provide you with great resources for a number of geography related topics. Our bulletin boards will help you integrate various activities into your daily curriculum. Ideas within the geography bulletin board pages include resources for the following: the five themes of geography, regions, postcards, world geography, and timelines. I bought a large world map at the teacher store, cut it and laminated it. I placed it on the wall with black border and placed the caption, "Plot your Course Wisely." We can use dry erase markers to plot a starting point and a destination, estimate distance, or compare routes. It is an excellent interactive board that helps the kids discover important concepts on their own. Put up a map of the US on a bulletin board. Try to receive a picture postcard from every state. As they arrive, have the students locate the state from which it came, mark the state with a map pin, and then display the cards on the board around the map. You can also have a small copy of the map that will allow students to also color in the state. This is a great way to learn state capitals as well. You may consider putting a post on our message board if you are interested in exchanging postcards with other classes. Visit our Pen Pals Support message board. Check out this fun book by Laurie Keeler!